With winter comes a whole slew of new care techniques and safety precautions – it can be overwhelming! Here at Westfield Foot and Ankle, LLC, we often see ankle injuries because someone slipped on a patch of ice or walked in boots that didn’t fit their feet. We want to help you keep your ankles safe this winter, so we put together a list of 5 easy things to do. Watch where you’re walking. When winter weather strikes, it’s important to be attentive to the conditions of the sidewalks. A clump of snow can hide an icy patch, and a seemingly slushy area can be a slippery spot. Try to walk in areas that have been cleared and salted correctly. Wear the right shoes. 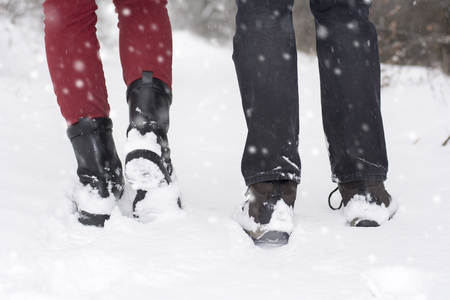 Winter boots should keep your feet warm and keep your ankles safe. Rubber soles with deep grooves on them are best for safe walking. Depending on where you are going, it might be tempting to throw on a pair of fashionable boots or even high-heeled shoes over the practical winter boot, but it is just not safe on icy sidewalks! You can always change your shoes when you reach your destination. Don’t carry too much with you. If your arms are full, it can impede your view of the ground in front of you. If there is a sizeable icy patch, rapid change in elevation, an unseen curb, or a large crack in the pavement ahead, you can easily twist your ankle if you do not avoid them in time. Get treatment for any existing conditions. If you currently have foot or ankle pain or discomfort, call us today for an evaluation. Our Podiatrist, Dr. David R. Sullivan has years of experience treating any number of foot and ankle issues. During the holiday season, people often spend more time on their feet and if you have a problem already, it could get worse! Foot pain could cause you to change your gait to compensate, which could lead to a trip or fall. Know what an ankle injury looks like. Even if you are still able to walk, your ankle might be sprained or also fractured. If your ankle is painful, you have stiffness in the joint, swelling, or bruising; it is likely sprained. If you injure your ankle this winter, give our offices a call. You can reach our conveniently located Westfield, IN office, serving both Boone and Hamilton County, at 317-896-6655.